For some, this money-saving tactic might cross a personal line you’re not quite comfortable with. For others, it can be a valuable money saver. It’s simple. Just find someone who wears clothes of similar size to your own and suggest a clothes swap. It’s a great way to get rid of items you might not necessarily like for some reason or another and acquire a bunch of items that might be perfect for you. I look at it as a free clothes upgrade for the items you don’t really like. My wife, on the other hand, had a wardrobe that practically intermingled with her younger sister for as long as the two lived near each other. They constantly were wearing each other’s shirts and pants, to the point that neither one of them knew who actually owned the items. It essentially gave them both a larger wardrobe to choose from without additional expense. My two oldest children do this, too. They often swap t-shirts and their sock drawers are essentially merged. Sharing items can save both parties money because it converts something you probably won’t wear that often (and are likely to eventually give away or put into storage) into something you’ll actually wear. So, how does this save money? For one, it turns the less-used pieces in your wardrobe into something you’ll use more often. If you take your least favorite shirt, for example, and transform it into an average shirt, that’s a big win for you, particularly if your friend or family member is making a similar upgrade for themselves. It’s essentially a free addition to your regular wardrobe, assuming that you try to avoid wearing your least-favorite items. The value really shines when you consider the eventual fate of those items you don’t really wear. They might end up in storage or become Goodwill fodder or wind up in a yard sale. In either case, you’re not getting much value in return for those scarcely-worn items. The value you get will not be enough to add much of anything to your wardrobe to replace it. With this approach, you’re getting a truly functional addition to your wardrobe in exchange for the item. That’s a much greater value than whatever else you might get for the item. Not only that, adding a fresh item to your wardrobe extends the life of all of your clothes. 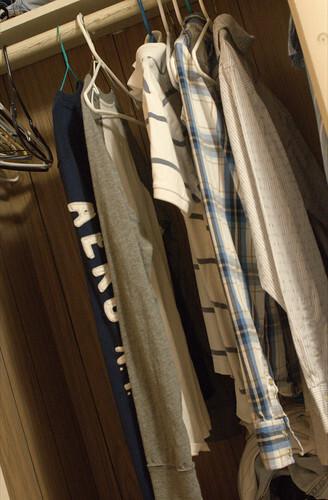 Let’s say you have ten shirts on regular rotation, along with two you never wear. Let’s also say that, after forty washings, those shirts are going to be too worn to wear. Let’s say you can get two wearings out of each shirt before a washing. In that situation, the items in your wardrobe will wear out in 800 days (10 shirts times 40 washings times 2 wearings per washing, assuming one day per wearing). Now, let’s say we transformed those two shirts you never wear into two shirts that you’re happy to wear. With that wardrobe expansion, each item of clothing will now last for 960 days (12 times 40 times 2). You’ve not only refreshed your wardrobe, you’ve added life to all of the clothes you already own without spending a dime. That’s another half a year before you have to replace items in your wardrobe. If you can find a partner to trade some clothes with, this is a pretty solid savings tactic. It refreshes your wardrobe and extends the life of all of your clothes without costing you a dime.